Many of us have goals we want to achieve that seem big, intimidating, maybe even impossible. We don't know how to make them come true because they're so incredibly big that we can't figure out how to actualize them. But what would happen if we broke them down into smaller pieces? What if we tried to just tackle one small bit at a time until we conquer the whole thing? Imagine what would happen if we just decide to start somewhere, anywhere, just for the sake of getting started and making a dent. 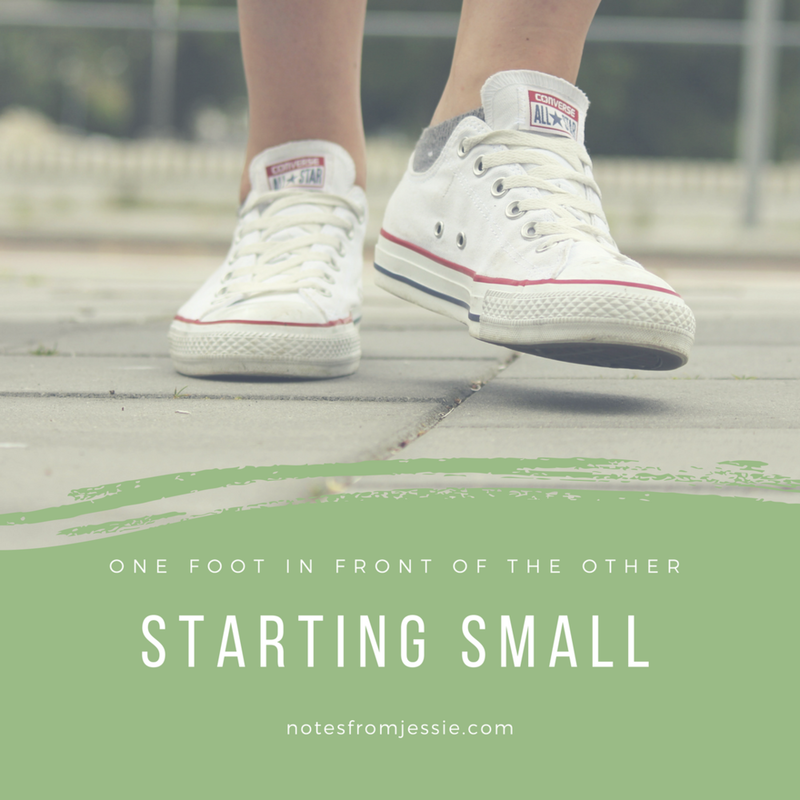 Instead of fretting over whether we're choosing the right entry point, we take a jump right into the mess and choose to work through it, little by little, because we know that even though it won't be perfect, it's better than standing paralyzed at the start line. Today I read a post by Ruth Soukup from Living Well Spending Less about how to crush your goals, and it reminded me of some truths I had forgotten about pursuing accomplishments. I'm learning that I need to write my goals down. In the midst of the craziness and busyness of life, I forget things. If I don't write them down, they're almost guaranteed to get lost in the chaos. On the other hand, if I write something down and put it somewhere I can see it often, I am frequently reminded of what I'm aiming for and can act accordingly. I also know that I need to continue reminding myself why I'm pursuing my goals. It's so easy to think certain tasks can wait or aren't important in comparison to others, letting myself fall back into bad habits instead of challenging them. But if I remember why I want to make changes, I'm more likely to stick to them. For instance, getting up early to workout isn't necessarily the most fun thing, especially in the winter when my bed is far warmer than the air on the other side of the covers. But when I tell myself that I will feel better, be more energized, get stronger, and be more ready for the day, I can more easily get up and lace up my shoes. Seeing everything through to completion is key. When we moved into our new place on Monday (more to come about that later! ), I was at a loss about where to begin. We had boxes piled up everywhere (I mean everywhere), and it was nearly impossible to know where to begin. I started on one task only to get pulled toward another twenty minutes later, starting a pattern that kept repeating itself, leaving a slew of half-finished projects in my wake. Only when I realized how inefficient that cycle was did I stop myself and focus on one task at a time. I unpacked the dishes, put things away in the front closet, and assembled the laundry sorter one at a time only by thinking about one of them at a time.